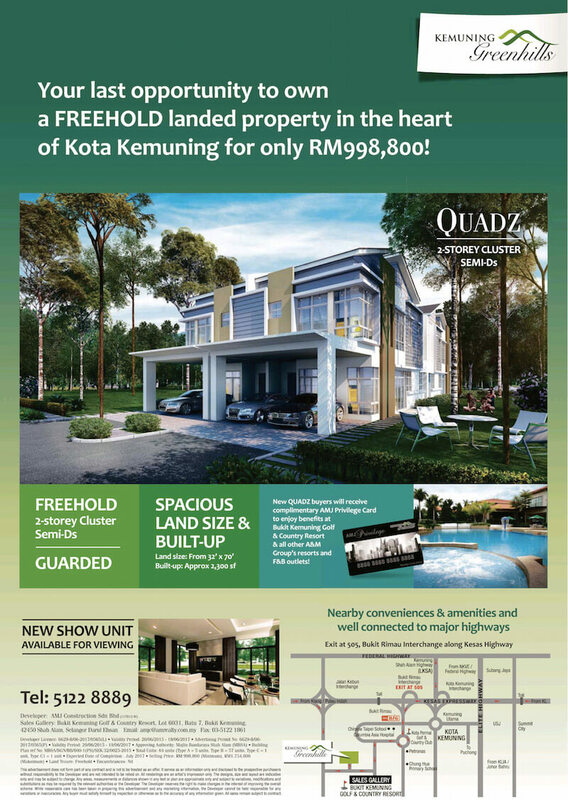 QUADZ Kemuning Greenhills is a FREEHOLD, 2-storey Cluster, semi-D’s and Guarded with spacious land size from 32’ x 70’ & built-up : approx 2,300 sf. Nearby conveniences & amenities and well connected to major highways. 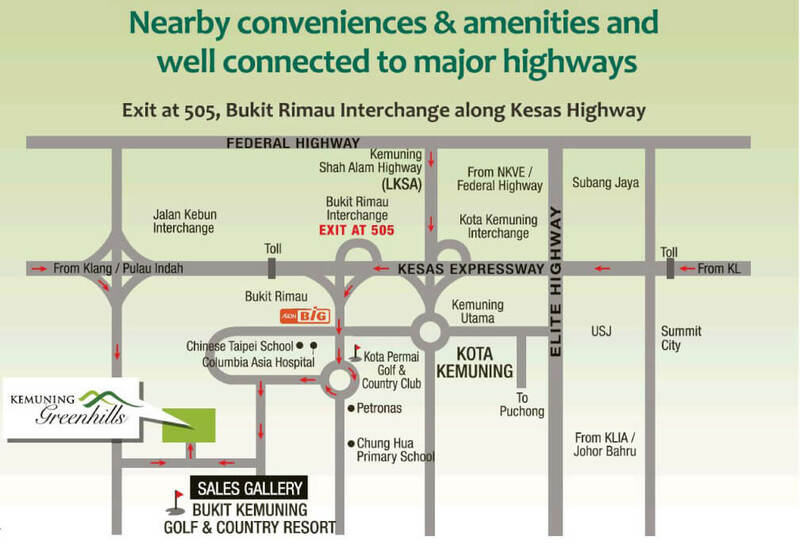 Exit at 505, Bukit Rimau Interchange along Kesas Highway. Bukit Kemuning Golf & Country Resort. 42450 Shah Alam, Selangor Darul Ehsan. Disclaimers : This advertisement does not form part of any contract and is not to be treated as an offer. it serves as an information only and disclosed to the prospective purchasers without responsibility to the Developer and are not intended to be relied on. All renderings are an artist‘s impression only. The designs. size and layout are indicative only and may be subject to change. Any areas. measurements or distances shown in any text or plan are approximate only and subject to variations. 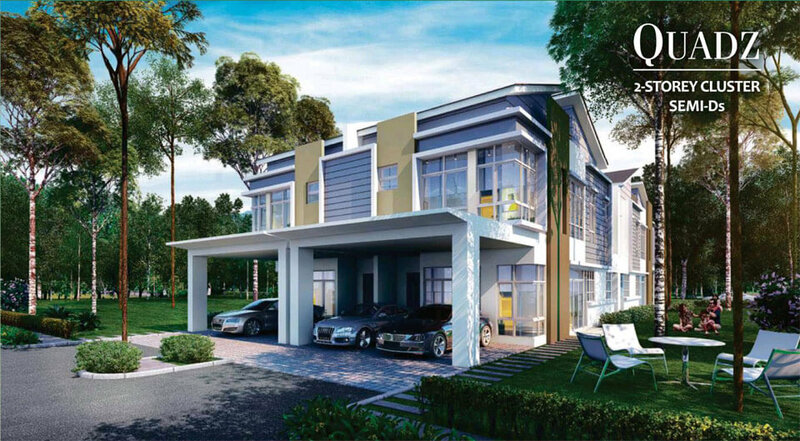 modifications and substitutions as may be required by the relevant authorities or the Developer. The Developer reserves the right to make changes in the interest of improving the overall scheme. While reasonable care has been taken in preparing this advertisement and any marketing information, the Developer cannot be held responsible for any variations or inaccuracies. Any buyer must satisfy himself by inspection or otherwise as to the accuracy of any information given. All sales remain subject to contract.